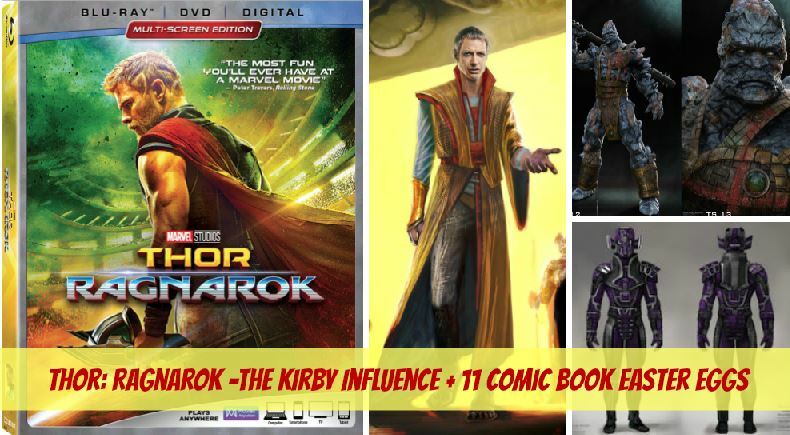 In support of next week’s Blu-ray & 4K release of Thor: Ragnarok, we have yet another insightful clip from the commentary track discussing the Jack Kirby influence on the world of Sakaar, along with concept art, plus a variety of additional comic book Easter eggs from Taika himself! The initial Hela costume is loosely based on the comic design and transitions into the iconic version when she returns to Asgard. Her weapons were based on Gorr the God Butcher's weapons from the "God of Thunder" comic storyline. Sakaar's design was taken from Jack Kirby's artwork. Taika was a fan as a kid and incorporated many shapes and colors from classic comics. The obedience discs are power inhibitors lifted from the "Planet Hulk" comic storyline. The designs of many background characters in Sakaar were also lifted directly from Jack Kirby comics. Traditionally, the Grandmaster in the comics is blue-skinned, but they thought people might tie it back to Jeff Goldblum's character from "Earth Girls Are Easy." The characters of Korg and Miek are from the "Planet Hulk" comic storyline. Taika based Korg's voice on the Polynesian bouncers in New Zealand, many of whom are extremely polite and don't want to hurt anyone. The large wolf, Fenris, is a great ally of Hela's in the comics. The mural on the back wall of The Grandmaster's suite is actual Jack Kirby artwork. After years of fans asking for it, Thor finally got his helmet in the Sakaarian battle arena. Odin's spear, Gungnir, appears in the background of the throne room on Asgard. Hulk's Sakaarian wardrobe casual wear is lifted from various Hulk comics.